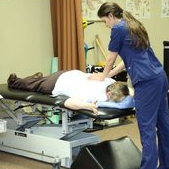 Spinal Decompression is a type of traction therapy applied to the spine in an attempt to provide better and more accurate spinal alignment for patients with various degrees of spinal mal-rotation and injury. Reduction of pressure within the spinal discs to promote retraction or repositioning of a herniated or bulging disc. Reduction of pressure in the disc allowing for increasing migration of the body’s natural healing elements to promote recovery from spinal injuries.